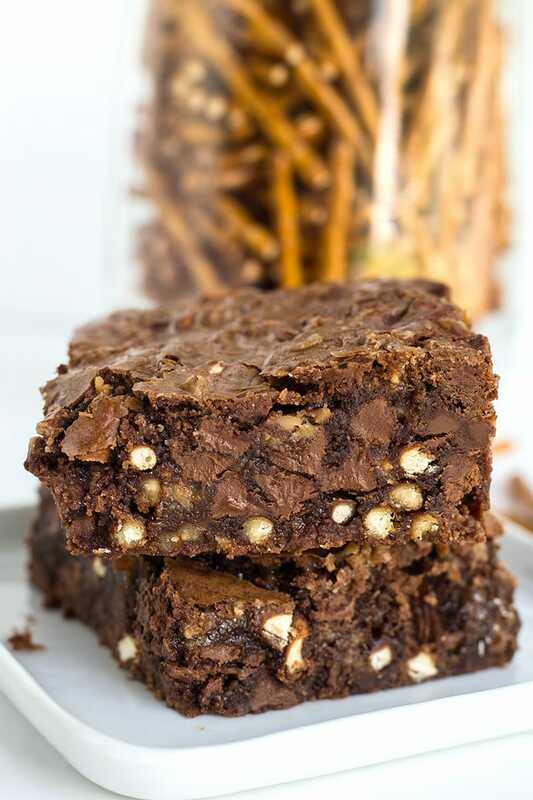 These Pretzel Toffee Chip Brownies are a delicious mix of sweet and salty. 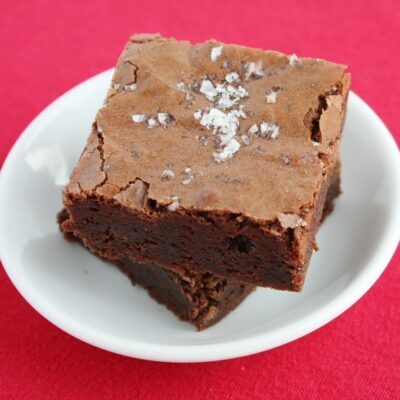 I’ve seen Fleur de Sal (salt) topped on truffles before, so I knew it wouldn’t be that much of a stretch to pair the salty/sweet in a brownie. Toffee bits and pretzel pieces within make for a thick batter. I spread it out evenly in a half-sheet pan, but if you don’t have one then you can use a 9×9-inch pan. 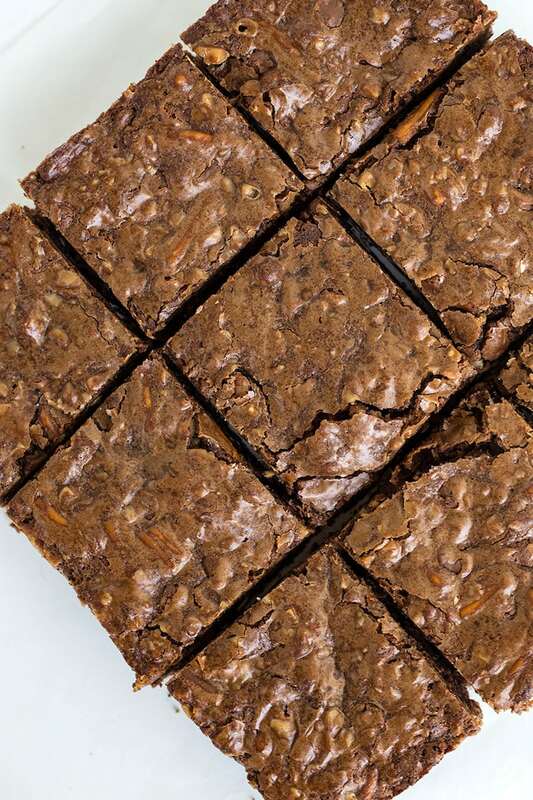 If you use the square pan, you’ll get brownies that are a little thicker. 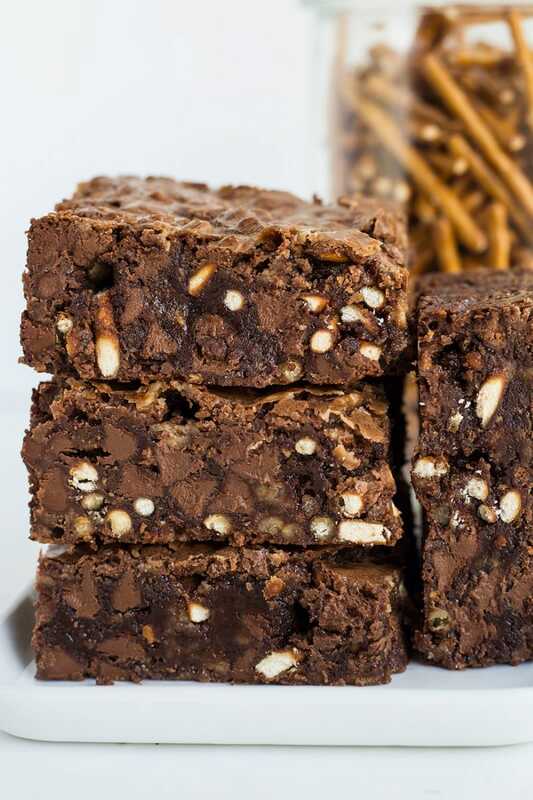 I tend to like nice, thick brownies so that works out just fine. You can see from the photos that they are packed full of chocolatey goodness. It’s impossible to eat just one! The pretzels do not stay hard and crunchy- nor do they turn into mush. 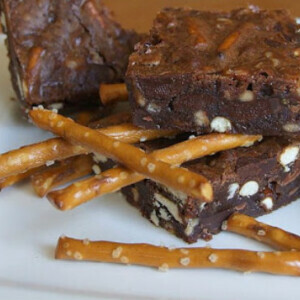 Instead, they hold a nice form and add a bit of salt flavor and a slight crunch to the brownie. Does that surprise you? I was definitely pleased with the outcome. Since my family isn’t a big fan of nuts, I never put them in brownies. 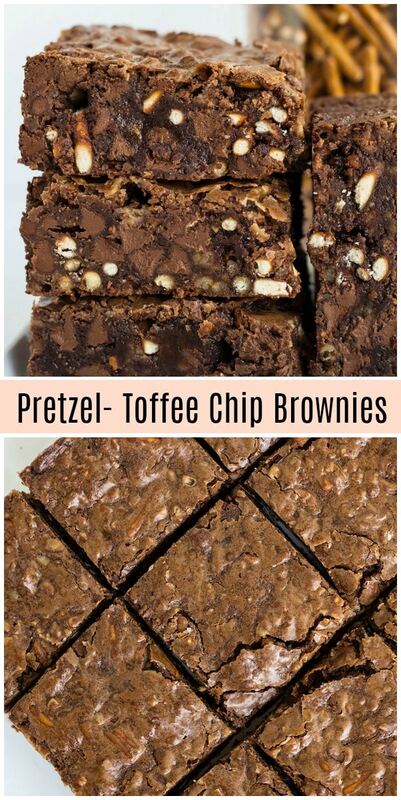 Pretzels and toffee bits are a nice, crunchy alternative to nuts if you like a brownie that has some crunch to it. With a bag of bittersweet chocolate chips added to the batter just before baking, they definitely turn out to be a very fudgy, chocolatey treat. And they are even better served warm with a little scoop of vanilla ice cream and a drizzle of caramel sauce on top! 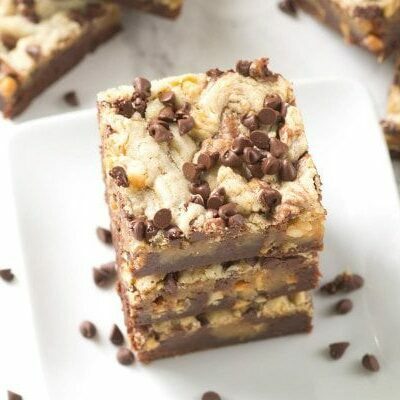 Or if you prefer to make recipes using Heath Bar candy bars (toffee and chocolate together), you will want to try Cream Cheese Swirl Brownies with Heath Bars and Pecans or this Frozen Caramel Toffee Ice Cream Sandwich Dessert. The perfect blend of sweet and salty! Preheat oven to 350°F. Line a half-sheet pan (or 9x9-inch square pan) with foil. Spray lightly with cooking spray. Melt the butter and unsweetened chocolate in a small saucepan. Transfer the melted mixture to a bowl and let cool slightly. Whisk in the sugar, flour, and eggs. Stir in the chocolate chips, toffee bits, and pretzels. Pour the mixture into the prepared pan and spread evenly (the batter will be thick and chunky). Bake 12 to 15 minutes, or until the brownies appear firm and done. 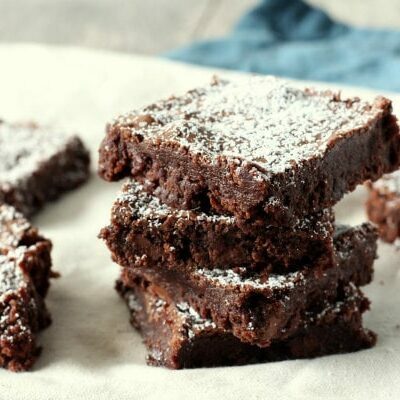 *A half-sheet pan will give you thinner brownies. 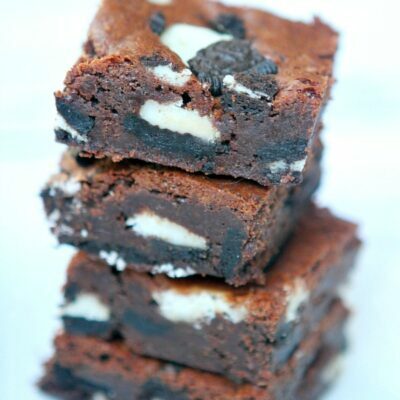 A square pan will result in a taller brownie. *These are best when eaten within 24 hours of coming out of the oven. 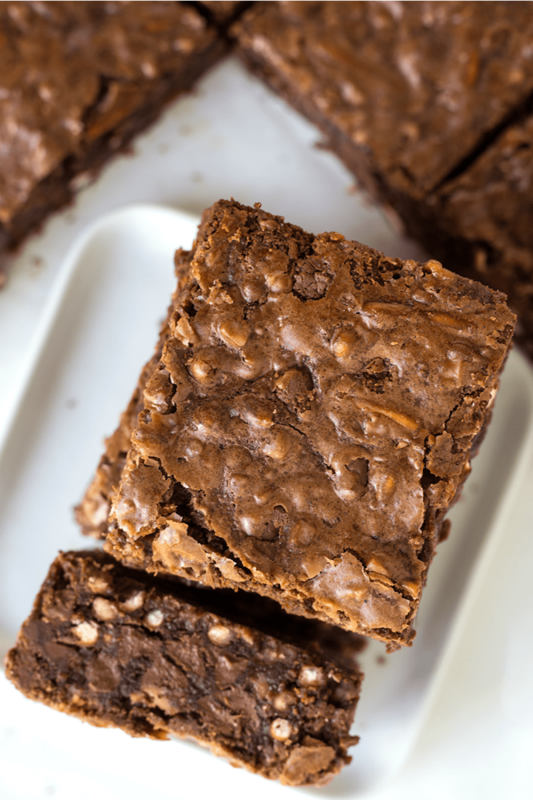 *Try drizzling caramel over warm brownies… yum! This recipe was originally published in 2008. It was edited and re-published in 2019.